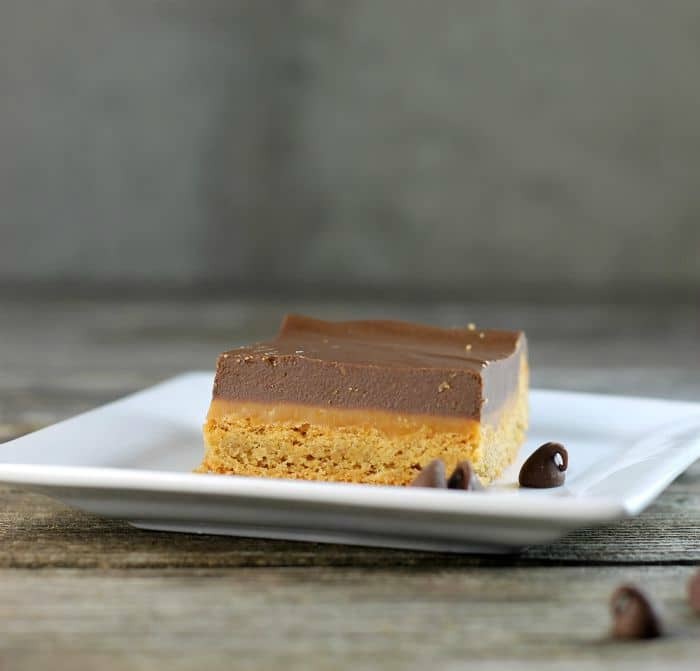 Peanut Butter Caramel Bars with a peanut butter cookie crust topped with a gooey caramel filling on top of all this a thick layer of chocolate peanut butter frosting. 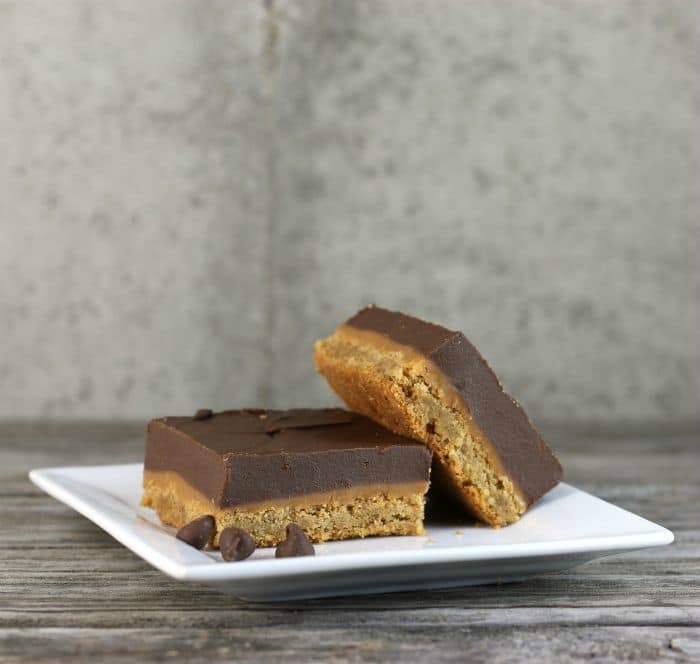 Peanut butter caramel bars are the ultimate cookie bar for anyone that loves the combination of peanut butter, caramel, and chocolate. They are simple to make and so irresistible. I am totally excited to be writing this post today. 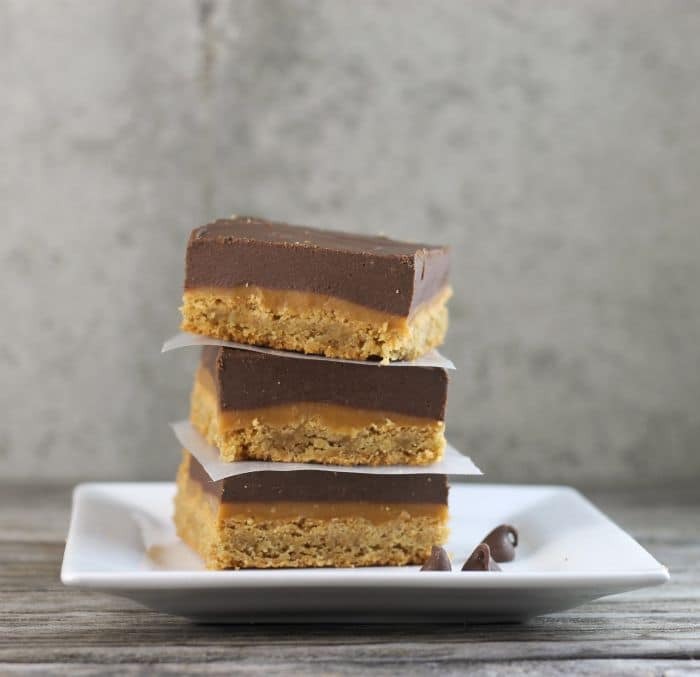 Chocolate and peanut butter are one of my favorite combinations and when you throw caramel into the mixture it takes it over the top. Mike is not a fan of peanut butter, he tries it every so often, but he just doesn’t like the flavor at all. So that means I don’t make a lot of dessert with peanut butter. As I mentioned my daughter is getting married, like in less than two weeks. So when she had her bachelorette party I mentioned that I would help with the food. These bars were part of the food that I sent for the party. Of course, I had to sample the bars before I packed them up for the party and they were so yummy. Yes, they were so yummy that I had to make them again later the same week. Can you say good-bye diet? No, I didn’t keep them all for myself. I shared them with my mom and my kids. The last of the bars were sent home with my youngest son because I couldn’t stop myself from sneaking a bite every once in a while. Yeah, they are really that good. As I mentioned before these bars are easy to make. The bottom is a basic peanut butter cookie, the caramel is a bag of caramel bits (melted with cream), and the frosting is chocolate chips and peanut butter. But the combination is excellent, total yum. 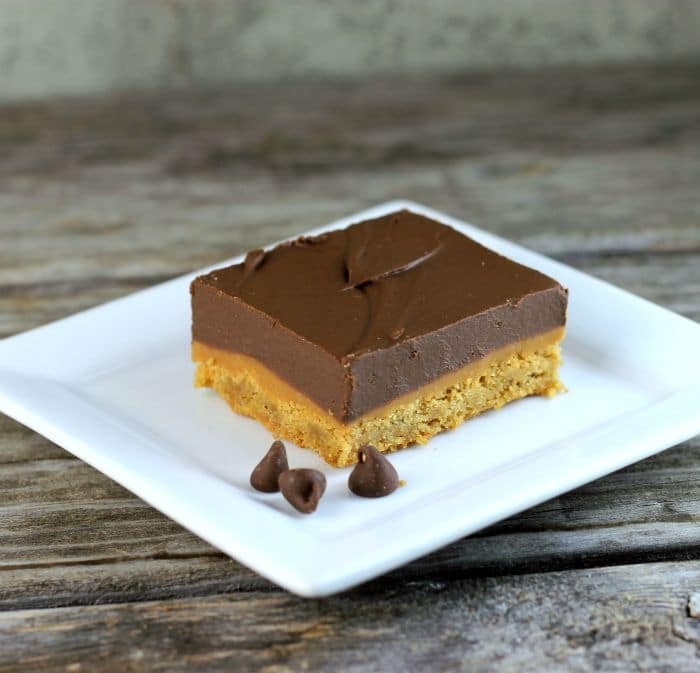 If you are a peanut butter fan you really need to make these peanut butter caramel bars ASAP. Preheat oven to 350 degrees F. Grease a 9 by 13-inch baking pan. Cream together 1/2 cup of the peanut butter and butter and then add the sugar and brown sugar and blend together. Mix in the egg and then the vanilla. Sift together the flour, baking soda, and salt. Add this to the peanut butter mixture and mix until well blended. Pat the dough into the prepared pan. Place in the preheated oven and bake for 22 to 24 minutes. Once the crust is baked remove it from the oven and melt the caramel bits. Place the caramel bits in a microwave-safe bowl along with the cream. Microwave until melted stirring about every 30 seconds. Pour the melted caramel over the bars. Set the bars on a cooling rack and cool completely. Add the milk chocolate chips, semi-sweet chocolate chips, and the remaining 1/2 cup peanut butter in a microwave-safe bowl and melt together. Mixing every 30 seconds. Blend together and spread over the cooled bars. They look so inviting with those gorgeous layers! This is really an awesome combination of these three. I love the peanut butter soooo much. Loved the light and dark color combination. ans the way you presented this is really commendable. Thanks for sharing this recipe with us. Best wishes and Regards. Oh my gosh, these bars look amazing, Dawn! I can totally see why you needed to get these out of the house…I would’ve just kept snacking on them, too. And then I would have been surprised to see the entire batch gone in just a day. Haha! Best wishes to your daughter with the upcoming wedding. It’s a busy time, but oh so exciting, too! I know you are very excited for her!! These look positively delectable Dawn! I don’t think I could have them in the house either – they’d disappear way too fast! !